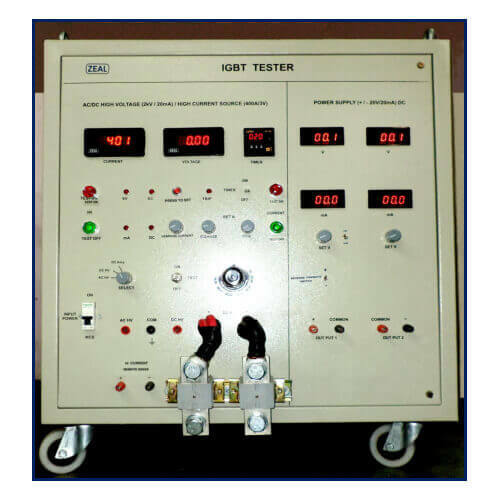 Designed with better features and accu, our offered range of IGBT Tester is meant for performing IGBT Test. Thus, this is fabricated to be used in measuring voltage of transformer, electronic instruments, motors, components and control panel. DC High Current section 1) To check VCE Saturation at rated current. 2) To check Diode forward voltage drop at rated current. Voltmeter: to measure diode forward drop or VCE saturation. DC High Voltage Section 1) To check Vce Max 2000 V, 50 m A.
kV meter: to measure voltage. AC High voltage Section 1) To check Isolation voltage 2500 V, 20 m A. Indications: Trip, HV On, HV Off.